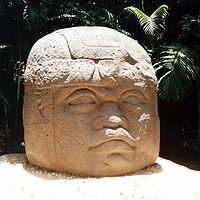 Monument 1, one of the four Olmec colossal heads at La Venta. The Olmec were an ancient Pre-Colombian people living in the tropical lowlands of south-central Mexico, roughly in what are the modern-day states of Veracruz and Tabasco on the Isthmus of Tehuantepec. Their cultural influence, however, extends far beyond this region. The Olmec flourished during the Formative (or Preclassic) period of Mesoamerican chronology, dating from 1200 B.C.E. to about 400 B.C.E., and are believed to have been the progenitor civilization of later Mesoamerican civilizations. However their culture disappeared for reasons unknown. Still, much of their culture remains and the Olmec are credited (at least speculatively) with many innovations in Mesoamerica, including writing, the calendar using zero, and the Mesoamerican ballgame prevalent in the region. Their place in human history remains significant and not to be forgotten, most obviously seen in the colossal stone heads, examples of which have been found around the area they inhabited. This page was last modified on 15 September 2014, at 19:46.